Fig: water as a major modifier of the micro-climate in Sangath, Ahmedabad. This section briefly presents case studies that have adopted passive cooling strategies. 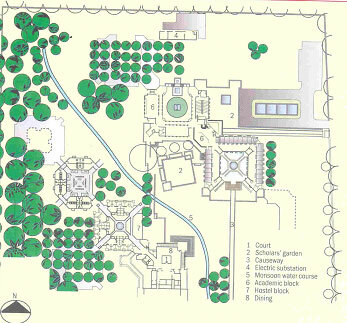 Courtyard planning: The building of the Indian Institute of Health Management (IIHMR) adopts compact planning of the buildings around landscaped linked courtyards. These can be used as a modified of micro climate and helps in increase of heat loss by ventilation. The courts were built upon as ‘faculty court’ and ‘academic court’. The ‘faculty court’ brings together research and administrative functions, and ‘academic court’ where the training functions are organized. (source: Energy-efficient buildings in India, Mili Majumdar, TERI & MNRE, 2001. 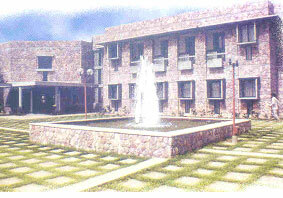 Fig: Entrance of the IIHMR building, Jaipur with forecourt and fountain. Wind Tower: The solar passive hostel at Jodhpur had taken the advantage of wind tower for providing evaporative cooling in the hot & dry climate of Jodhpur. The prevailing direction for cool winds in Jodhpur is south-western. Window apertures are difficult to provide in this orientation, as it is least favourable from the point of view of solar radiation. 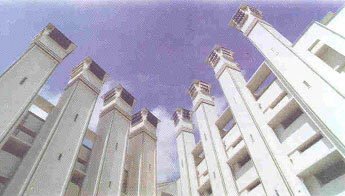 To overcome this problem, a wind tower concept was used. 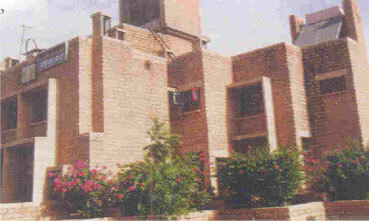 The tower facing the wind direction has been located over the staircase, thus minimizing costs. Cool air is provided to each room from this tower and normal windows or smaller shafts facing the lee of the wind have been provided to distribute the cool air throughout the building. The tower catches only the cool wind from the south-west, avoiding warmer air from other directions. (source: Energy-efficient buildings in India, Mili Majumdar, TERI & MNRE, 2001. Passive down draft cooling: The Torrent Research Centre in the hot & dry climate of Ahmedabad had adopted the feature of passive down draft cooling to minimize the use of conventional air-conditioning. The design was aimed at integrating spaces requiring highly controlled conditions with those requiring less-controlled conditions while minimizing the presence of dust in the internal environment. Passive cooling is attempted through a system of designated inlets and outlets shafts. The shafts as a consequence of their locations, sizes, heights, and their complex but stimulated and in-depth researched configuration generated the required movement of air in different spaces without using any mechanical or electrical energy. (source: Energy-efficient buildings in India, Mili Majumdar, TERI & MNRE, 2001.